According to a study by New York University’s Furman Center, the “number of renters in Boston has risen rapidly in recent years, while the number of available rental units has dropped”. It is now more important than ever, with the increased number of people looking to rent, to make your property stick out in the eyes of renters. How are you supposed to do that? Simply stated, with a little bit of curb appeal. What is curb appeal? Curb appeal is the process of beautifying ones property in the front of the house to attract renters to rent. Planting seasonal flowers and trees native to your area can do this. It is of much importance to provide a great first impression to renters. In addition to planting flowers, one needs to make sure the lawn is properly mowed, as well making sure the grass is as green as possible is a must. Nobody likes the idea of walking up to a house with yellow, dry grass. That is an automatic negative before they even walk into the apartment. Apartments can always use some individuality from door to door. One way to rid your potential renters of this issue is to set up planters around the property. This gives the apartments a sense of individualism that helps them stand out. Another thing that all renters enjoy is the use of a common area outdoors. Block off a specified area with stone or bricks for your renters to enjoy with their family. In this blocked off area install a feature of your choice. A grill (or several) for your renters to use for Sunday night dinners, or really any summer night. A second popular option is a fountain. A fountain gives the property a sense of serenity. When viewing a property if a potential renter feels calm and at home when viewing the apartment they are more likely to rent from you in the future. Although it is all dandy to install all of these great solutions to curb appeal, it doesn’t mean anything to potential renters if the grounds are not kept up. 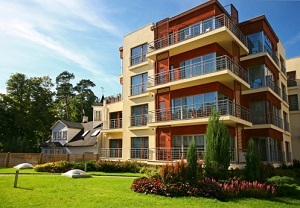 As a landlord it is imperative to maintain your grounds for all renters to enjoy. One way to maintain the grounds is by replanting all seasonal plants. Similarly the landlord is responsible for making sure that the trees and bushes are trimmed regularly. Lastly, the grass may seem insignificant sometimes, but in reality, well groomed grass is a basic that all potential renters have come to assume will be done well. If your grass is out of place, your curb appeal rating will decrease dramatically in a matter of seconds in the eyes or potential renters.